…and everything in between, my kitchen time has become far less experimental and much more structural. For example, I know that to meet our crusty, delicious bread demand I need two loaves per week and thus, have scheduled to make it accordingly. I also know that to meet our snack and lunch demand, I need to have premade goodies prepared. I need homemade larabars. There is a reason people grab for chips, fruit snacks, and candy bars. They’re convenient. Today, I want to share a recipe with you that easily met our “snack” demand for two full weeks. Having pre-made snacks is essential to not falling off the whole-food bandwagon. You simply have to have the options available when time is of the essence! And the best part? It took me (literally) fifteen minutes. Fifteen minutes from pulling the ingredients out to finishing up the last of the dishes. I swear. And the second best part? I made these for less than 20% of the retail cost. Oh yea, baby. It’s all about the homemade larabars. To make, all you have to do is throw the nuts in your blender until they’re a nice, fine texture. Then, throw in the dates and remaining ingredients. Blend until well combined. If it doesn’t stick together when you pinch the mixture in between your fingers, add a few more dates to help make it more “sticky”. Once it’s a all chopped up, simply press the mixture down into a pan (I lined mine with parchment paper for easy removal). Stick in the fridge for a few minutes to help it set, remove, and slice or shape into bars. The possibilities of nuts and flavorings are endless. You can easily sub in dried cherries, dried mango, dried banana, peanut butter, etc. It’s just a matter of finding your family’s favorite flavor of homemade larabar! And did I mention they are very inexpensive compared to their commercial-sold twin? Larabars usually sell for $2 a piece, people! Yikes! The only super important part of this recipe is adhering to the correct ratio: 1 cup nut to 1 cup date to 1/2-1 cup “extra”. And like I said, if it’s not sticking together correctly, throw in a few more dates and you’ll be good to go. Some fancy people individually wrap homemade larabars in wax paper and tie them in twine. Oh-so-lovely but oh-so-time consuming. 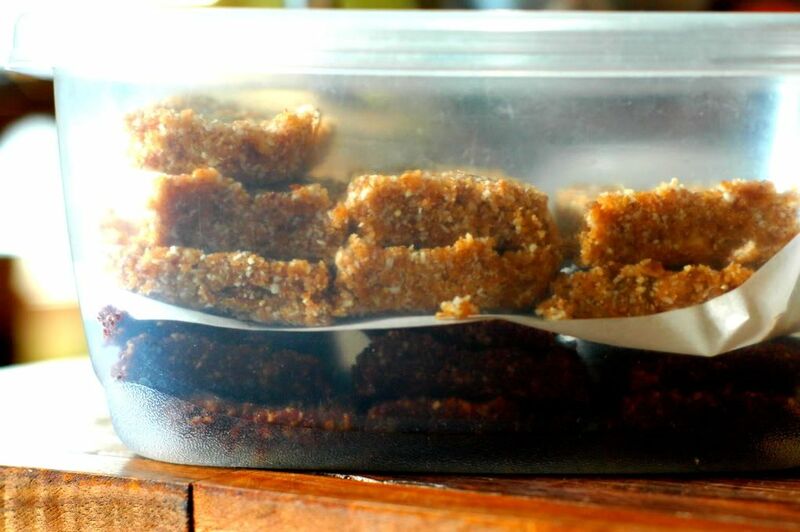 I was on a mission, and thus, I sliced mine into bars and shoved them into a big tupperware bound for the fridge. When we’re packing our lunches, we simply grab a bar out. Easy peasy. As life gets busier (and more fun! ), having a kitchen system set into place and having wonderful “go-to” recipes for snacks makes a big difference. There’s not always time to play in the kitchen, but that doesn’t mean that I still can’t whip out some delicious whole-food goodness for the family. « Gentlemen: Start your engines…errr…seeds! I pit the dates by pulling the top off, opening it up the long way, and pulling out the seed. Is there a faster/easier way to do it? Those bars look delicious. I recently made the cashew cookie and coconut cream pie type and shared them on my blog, but I want to try your chocolate version, possibly using carob powder. We do balls and hubs calls them “Lara-balls”. I just have the kids use the one tablespoon measure as a scoop. Great ideas! I am linking this to my blog FB and FB group. Thanks! I’ve also used dried figs, dried apricots, and raisins depending upon what we had in the house. A cheaper way to make the coconut is to add oats instead of nutes. (Oh, and a dash of cinnamon) There is less fat that way, not that I care. I roll them up in little bite size balls and serve them as dessert. They are always a hit with the sugar-free crowd. I stumbled upon your blog this morning…and a few hours later I am encouraged and empowered. We have been eating whole foods for the last 3 months (even though I had the knowledge years ago, the will-power was not so forthcoming) and I have been on the search for easy great recipes. I made these this morning after reading how quick and easy they are (and that could not be more true) and my girls and I LOVE them! YUM! I did the Coconut Cream and used soaked-dehydrated cashews. Thank you for sharing your wisdom. I will be sharing your blog and pinning things to pinterest so I can come back and make more homemade goodness! Thank you! Might as well give it a try and see! I bet prunes would be good, too! Just made these bars with Sunflower Seeds instead of nuts and they turned out delicious! We added mini dairy free chocolate chips too. My son loved them, and since he can’t have nuts this was a great alternative. Will probably lower the coconut oil to 1 tsp next time as they turned out oily. It is more than likely because the sunflower seeds are oily by themselves. There is no limit to the different types you can make with these bars! Thank you for sharing this great recipe. LOVE your site. These look yummy! We made the cookies you posted recently and they were divine. We shared this with our readers at homesteadlady.com. 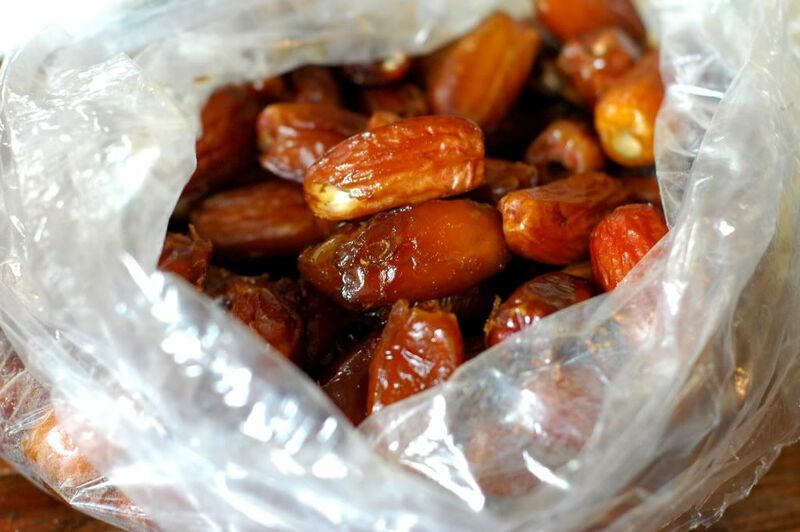 Does it matter if the dates are organic or not? I followed your link to the dates. Do you still buy those same dates from Amazon? Thanks!! I buy them from wherever I can get the best deal. I usually opt for organic. I just got my From SCRATCH cookbook! I Absolutely LOVE it! I just made this recipe and my hubby and boys ALL LOVED it! They devoured them! I LOVE larabars but I thought these were even better! I am loving reading your blog, you remind me so much of ME! I think we could be best friends if we lived close, is that weird??? My all time favorite cookbook has always been Nourishing Traditions, But Man I LOVE your Cookbook, it goes perfectly with Nourishing Traditions, it’s the perfect companion! I am so excited about it, I got it Friday and read every single page by Saturday evening! Your Family is so cute! Thank you for writing your cookbook! I am horrible at organizing but your book makes it look so much easier! Possibly? I’ve never tried it! These are really good, but had to use 2 cups of dates rather than 1. They still crumbled apart even after putting them in the freezer for awhile? Not trying to complain, just wondering if you had any advice? Also wondering if they are actually more expensive than just buying Larabars-especially since it was 6 dollars for just 2 cups of dates (plus the other ingredients). I live in Mississippi right now and there are no health food stores around so the only option for dates is at Walmart-$3 for an 8 oz bag. Any thoughts? Lauren, it sounds to me like the dates that you used were probably old… and thus, didn’t have a lot of moisture left in them. Perhaps try ordering from Amazon? That may be a better way to find a good deal on better dates! I always wonder what to use instead of dates when I see recipes like this. The recipe always sounds so good, but I am allergic to dates! ugh! I just made these with prunes and there were delish! I have never had a lara bar so I cannot compare but these were great! 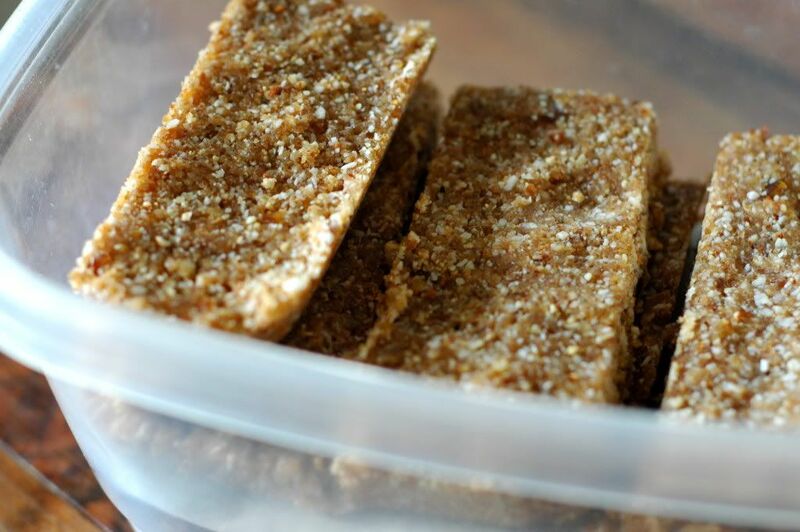 I have made these larabars several times and love them! 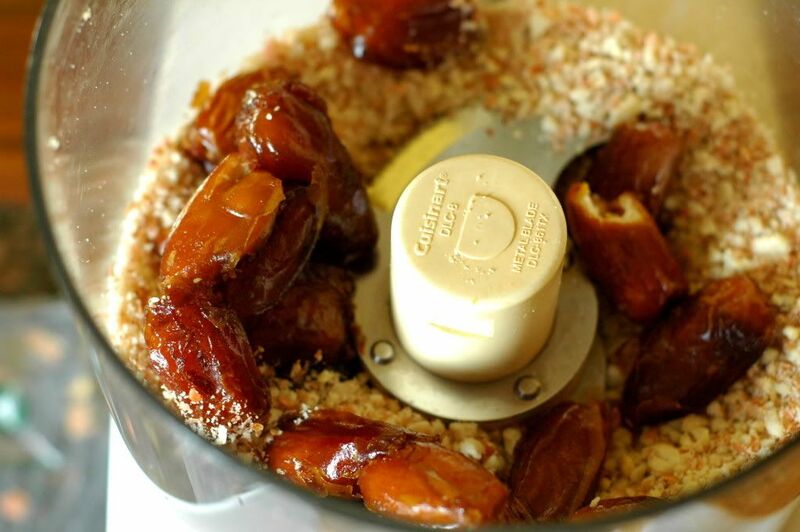 Recently my dates have not been breaking up in the food processor. The bars come out with clumps of dates mixed in. Are the dates old? Or does my food processor blade need sharpening? Any ideas? Thanks! We don’t have Lara bars in Australia but I keep hearing about them, so this will solve the problem for me – I’ll make them!! THANK YOU! Although my favorites are BIG soft Medjool dates, I’ve also successfully substituted dried figs, raisins, and dried apricots (check out Nuts.com for a high quality product shipped über fast with incredible customer service). Current fav flavor combo is to use dates, pecans and cinnamon… reminds me of pecan pie. 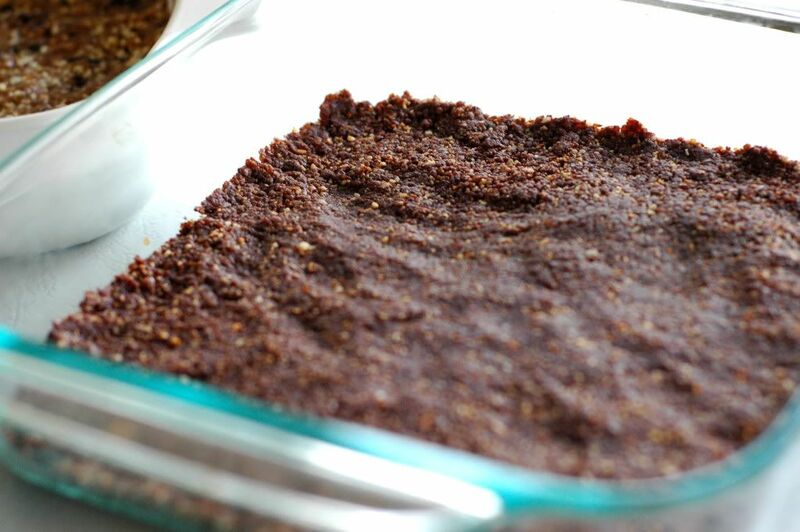 Second fav would be dates, walnuts, and cocoa powder – really taste like a brownie the 2nd day (if you can wait that long) and if you really wanna take them up a notch, mix up a ripe banana (or avocado if you’re feeling adventurous) and some cocoa powder and frost them. I’ve been looking for a snack that is simple, easy to make with simple ingredients, and is delicious. And these hit the spot. I made the chocolate ones (chocoholic here), and cannot wait to make them again. Love the recipe! Honestly, I could not believe how easy they are to prepare. Thanks for sharing!!! I love the # one hing on the list that you have. I teach my grandchildren the Bible now days. Not many do these days! thanks for sharing going to try your recipes they sound so good! I will be making these as soon as I can get to the store thru the snow! I love larabars, but am allergic to dates- any suggestions for a substitute? These are wonderful and so easy to make! I made the coconut cream version today, adding a scoop of vanilla Sunwarrior protein powder. Yum! The chocolate version is next. . . I usually roll mine into balls. I will definitely be making these this week for my fam. Can’t wait. I would like to post these to my FB page if that is ok with you. Just made the chocolate ones, they are divine! Mine also seemed a bit dry at first but the more i pulsed them in the food processor the stickier they became. Thanks!